The Wurlitzer was first installed in the Ritz cinema at Chatham, Kent and was opened by Harold Ramsay, then the Musical Director of Union Cinemas, on 22nd March 1937. When the cinema closed the organ was placed in storage for several years. 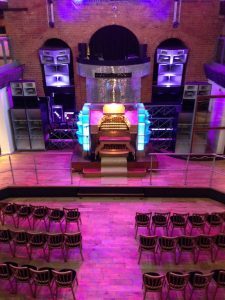 The Shropshire Theatre Organ Trust bought the organ and installed it in the Buttermarket in 1988. The organ originally had 8 ranks when at Chatham, and the installation at the Buttermarket was by David Pawlyn. This ‘De-luxe’ Union Wurlitzer was designed by Harold Ramsay, and featured a double-bolster stop rail, a fully-unified three manual console, a comparatively rare Wurlitzer 32′ resultant pedal stop and, when installed in the Ritz, a phantom piano installed on its own lift. The organ has recently been enlarged to 10 ranks with the addition of an English Horn and Kinura.